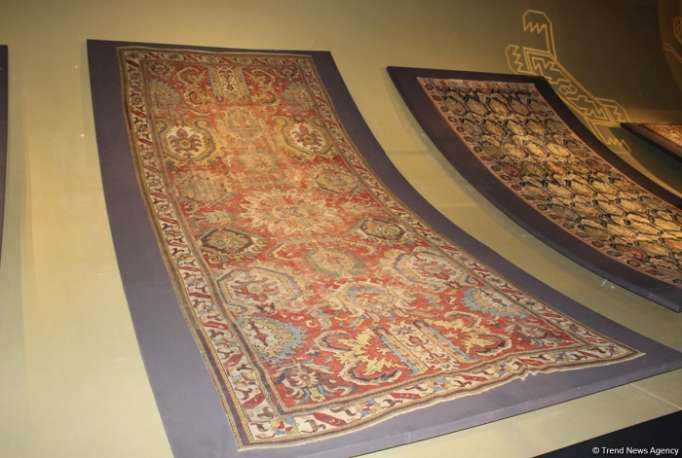 Two carpets donated to the Azerbaijan Carpet Museum in Baku – the Nakhchivan carpet dating back to the 17th century and the Haji Gaib carpet dating back to the 19th century, were showcased as part of the Nasimi Festival of Poetry, Arts, and Spirituality. The festival, dedicated to the work of Imadaddin Nasimi (1369-1417), one of the brilliant poets and thinkers of the East, is being held in Azerbaijan Sept. 27-30 under the organization of the Heydar Aliyev Foundation and support of Azerbaijan’s Ministry of Culture. In her speech at the event, director of the Azerbaijan Carpet Museum, chairperson of the ICOM Azerbaijan National Committee, honored cultural worker Shirin Malikova noted that significant events in the field of culture and art have been recently held in Azerbaijan, and the Nasimi Festival of Poetry, Arts, and Spirituality under the organization of the Heydar Aliyev Foundation and support of Azerbaijan’s Ministry of Culture is one of such events. “As part of the festival, wonderful and interesting events are being held in the exhibition halls, museums, concert halls, creative centers, open-air venues, where guests from different countries also participate,” she said. Malikova stressed that two new exhibits have been showcased as part of the festival in the Azerbaijan Carpet Museum. The Nakhchivan carpet dating back to the 17th century was returned to Azerbaijan on the initiative of the Heydar Aliyev Foundation. The large size of the carpet, the composition created with high professionalism and color harmony prove that the carpet was woven by special order in a large workshop. Malikova noted that this sample of art is the third exhibit donated by the Heydar Aliyev Foundation to the Azerbaijan Carpet Museum. Earlier, the museum was gifted with Karabakh’s Khatai carpet of the 17th century and embroidery dating back to the 18th century. Talking about the Haji Gaib carpet of Azerbaijan’s Guba district dating back to the 19th century, Malikova noted that Italian collector Mirco Cattai donated it to the Azerbaijan Carpet Museum. The museum collection titled “Fleecy carpets” was enriched with six rare carpets including the above mentioned examples of art during 2018. Head of the Office of Azerbaijan’s Ministry of Culture Fikret Babayev in his speech noted that the return of cultural values of Azerbaijan to the country is important. The work in this direction is being actively carried out, and the collection of the Azerbaijan Carpet Museum now includes unique and beautiful carpets dating back to the 17th and 18th centuries. Fikret Babayev noted that the Nasimi Festival of Poetry, Arts, and Spirituality is very important. As Italian collector Mirco Cattai stressed, he is very happy to donate the Haji Gaib carpet to the Azerbaijani museum. The collector also noted that he is happy to attend this event and he really likes the Azerbaijan Carpet Museum. Further, the participants of the event were presented a musical program, which included performances of the “Sound of Ages” Ensemble of Early Music Instruments of the Azerbaijan National Conservatory conducted by Orhan Hashimov, as well as “Mugam Souls” music group featuring Gochag Askarov (Azerbaijan) and Pierre de Tregomain (France).